You just got back from visiting your friends in California and the most relaxing time with them was spent in their own back yard swimming pool and spa. Now you’re home in New Jersey, staring out the window and wondering why you haven’t gotten around to purchasing an in-ground pool for your family. 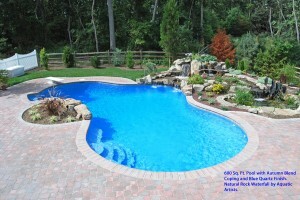 Since 1967 homeowners in Southern and Central New Jersey have called on Swim-Mor Pools and Spas as the premier custom in-ground swimming pool and hot tub supplier. With three convenient locations in Mt. Ephraim, Northfield, and Englishtown, New Jersey, our professional consultants are here to answer all your questions and share a stunning selection of in-ground pools and spas available for your home. Swim-Mor Pools and Spas is fully licensed and insured with one of the best overall warrantees in the industry. You’ve been dreaming of turning your backyard into your personal vacation place for years. It’s time to wake up and make your dream come true! Swim-Mor Pools and Spas in Northfield, Englishtown, and Mt. Ephraim is family owned and operated and has been turning backyards into vacation spots for 45 years. We construct with concrete only and have over 20 standard swimming pool and spa designs and sizes to choose from with custom options available. Swim-Mor offers a Lifetime Structural Warranty on your new in-ground swimming pool and hot tub, which is all-inclusive covering everything from swimming pool equipment to the pool finish. When you’re ready to make the investment in a swimming pool and spa from Swim-Mor, you can be sure our design experts will work toward the goal of creating the backyard oasis that reflects your personal style. You’ll be counting the day till summer begins!